A name that needs no introduction, Leonardo was the archetypal Renaissance man; a painter, sculptor, scientist, mathematician, inventor, musician and writer. He is known foremost as a painter, with world famous works such as his, Mona Lisa, Virgin of the Rocks, and, The Last Supper. His art was innovative, taking knowledge of the sciences and applying them masterfully to painting; unequaled for some in technique and expression. Throughout history and still today in modern culture, he continues to fascinate and inspire. He shares with Raphael (1483 – 1520) and Michelangelo (1475 – 1564), a triumvirate of brilliance during the High Renaissance. He was simply know as Leonardo, and took his surname from the small town of Vinci in Tuscany. With such a large scope of skills and works, this biography is limited to his work housed in the Uffizi Gallery. This includes, his Annunciation, from around 1472, executed while still in the workshop of Andrea del Verrocchio (1435 – 1488). The other is an early independent work, Adoration of the Magi, which he left unfinished for the Monks of San Donato at Scopeto in 1481. 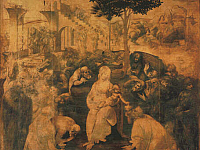 As with much of the Italian Renaissance, the source of Leonardo’s life comes from the biographer and artist, Giorgio Vasari (1511 – 1574). 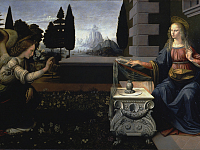 Leonardo’s, Annunciation, was produced around the same time that he contributed to Verrocchio’s, Baptism of Christ, also housed in the Uffizi. Verrocchio was already an influential painter, but according to Vasari, Leonardo’s Angel and landscapes next to Saint John, was the reason Verrocchio resorted to a dedication of sculpting; “never to touch colours again, angered that a young boy understood them better than he did.” (Vasari, The Lives of the Artists.) It is noted that Leonardo’s, Annunciation, one of two pieces by the same title, is composed in the style of the early Renaissance painter, Fra Angelico (1395 – 1455).